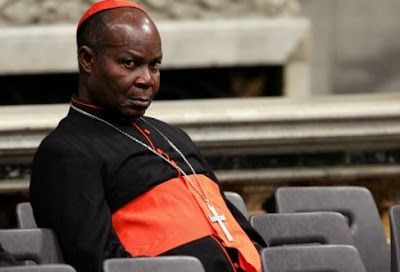 Former President of the Christian Association of Nigeria, Anthony Cardinal Okogie, has dismissed the federal system of government being practised in Nigeria as not serving the people. The former Catholic Archbishop of Lagos, in a statement titled, ‘Deprivation and Agitation: A Reflection on Nigeria’s Late 2017 Budget,’ which was sent to The Punch yesterday, decried the poor state of livelihood of Nigerians. Okogie said, “Some people do not want to hear of restructuring. However, for how long shall we fail to see the urgent need for far-reaching constitutional reforms in this country? The current arrangement is not serving Nigerians. The relationship between the government and the citizens places the citizen at gross disadvantage and the politicians at an undue advantage. The retired bishop stated that the level of poverty in the country was not acceptable. He charged Nigerians to question those who managed the resources of the country. He said, “To say that the quality of life of the average Nigerian is low is to state the obvious. Whether one talks of education, medical service delivery, security or the economy, every aspect of our life in this country is in downward motion. The extent of poverty experienced by our people is simply unacceptable. The vocal cleric said Nigerians witness the ritual of budget presentation to the National Assembly by the President every year. He said, “For a country that should be in a hurry to exit the Destitution Avenue, this is simply unacceptable. It is another instance of failure of governance. Failure of governance is when government fails to serve the people. Nigerians should be worried about the way the budgetary process runs in this country. The cardinal added, “Now, deprivation has turned into agitation. In the absence of a budget, the economic conditions in which we live continue to bite. Nigerians are hungry and angry. In their anger, they turn against each other on the social media, using unprintable language, threats and violence to sort out their differences. Young Igbo insult the Yoruba, young Yoruba insult the Igbo, the North and the South have suddenly realised that they cannot live together. “In all this, instead of facing their common enemy – politicians who abuse their offices and steal the wealth of the land, thus depriving us of decent living – young Nigerians tear each other apart in a society where civil discourse has become an unwanted alien.